NEW YORK -- Calgary Flames left wing Rene Bourque, St. Louis Blues goaltender Jaroslav Halak and Tampa Bay Lightning center Steven Stamkos have been named the NHL 'Three Stars' for the week ending Oct. 24. Bourque scored a League-leading six goals, including three game-winners, and added an assist in four games for the Flames, who posted a 3-1-0 record and climbed to first place in the Northwest Division. Returning from a two-game absence due to injury, Bourque tallied the only goal of the game in a 1-0 overtime victory at Nashville Oct. 19. He notched the third hat trick of his NHL career and added an assist in a 6-2 victory at Nashville Oct. 22 and concluded the week with two more goals, including his third game-winner of the week, in a 4-0 victory over the San Jose Sharks Oct. 24. 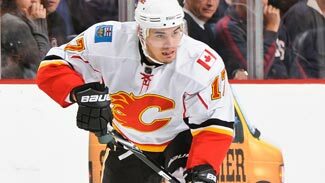 The 28-year-old native of Lac La Biche, Alberta, who scored a career high 27 goals with the Flames in 2009-10, leads his club in scoring this season (6-1--7) and is tied for the League lead in game-winning goals with Chicago Blackhawks forward Patrick Sharp (three). Halak posted a 2-0-1 record with a 1.62 goals-against average, .944 save percentage and one shutout, helping the Blues improve to 4-1-2 on the season. Halak helped the Blues take three of four points from a home-and-home series with the Chicago Blackhawks, recording 30 saves in a 3-2 overtime loss at Chicago Oct. 18 and stopping 23 shots in a 4-2 victory at St. Louis Oct. 22. The 25-year-old Bratislava, Slovakia native posted the 10th shutout of his NHL career and first as a St. Louis Blue with 31 saves in a 1-0 overtime win over the Pittsburgh Penguins Oct. 23. Acquired from Montreal in an off-season trade, Halak is 4-0-0 with a 0.99 goals-against average and .960 save percentage at Scottrade Center this season, helping the Blues extended their overall home winning streak to 10 games. Stamkos continued his torrid start to the season by recording a League-leading nine points (four goals, five assists), taking a four-point lead in the NHL scoring race with 8-7--15 in eight games. Stamkos notched three points (one goal, two assists) in a 5-4 victory over the Dallas Stars Oct. 18, ending the Stars' perfect 4-0-0 start to the season, and had an assist in a 3-2 overtime loss to the New York Islanders Oct. 21. He tallied the second hat trick of his NHL career, including the game-winning goal, and added an assist in a 5-2 victory over the Atlanta Thrashers Oct. 22 and concluded the week with an assist in a 4-3 loss to the Nashville Predators Oct. 24.